"Teaching in Boston means giving back to the same school district that equipped me with the knowledge and skills to be successful in life." Rene Reyes grew up in Boston, and though he had dreams of playing soccer, he decided that the best way for him to make a difference was to teach. Rene grew up in Roslindale and also attended Boston University, so he sees reflections of himself and his peers in the students he teaches everyday. Throughout his life, Rene has found opportunities to work with youth, and uses those interactions to show students that hard work and perseverance yields results that allow them to make continued contributions in their community. 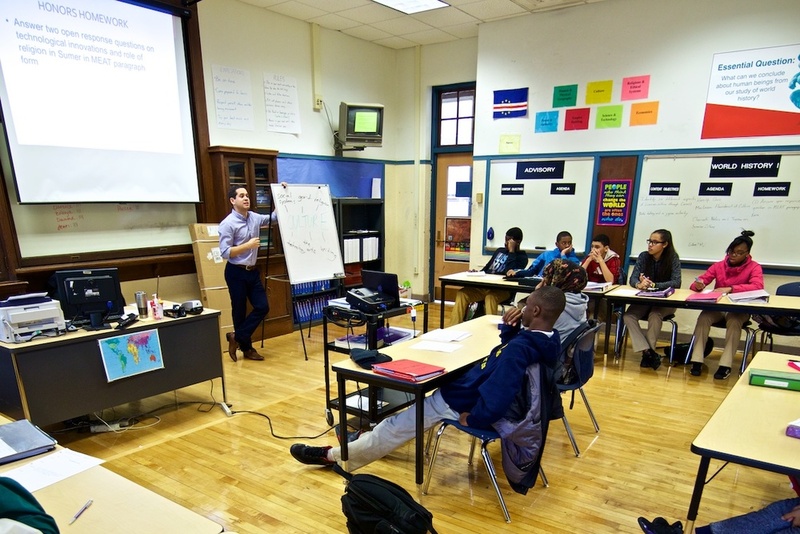 The Boston Public Schools Office of Human Capital sat down with Rene Reyes in fall 2014 to learn more about his experiences in the Boston Public Schools as a community member, teacher, and educator of color. Here's what we learned during our time with Rene. Describe your work experience in Boston. Working in Boston is wonderful. I really appreciate the supportive community of educators at New Mission High School. My colleagues constantly help me reflect on the ways in which I can improve my teaching practice. What is one of your keys to success in the classroom? I believe that getting involved with extra-curricular activities can very important to success in the classroom. I am serving as one of our school’s debate coaches. Thanks to debate, I have strengthened relationships with my 9th graders, met students from other grades, and implemented Evidence-Based Argumentation (EBA) in my own classroom to foster students’ learning. What are you proud of as an educator? I take great pride in being from Boston and teaching because it is my way of giving back to the same school district that equipped me with the knowledge and skills to be successful in life. I am also proud to have earned my master’s degree from the Harvard Graduate School of Education last year. What was the best lesson/unit you've ever taught? I love teaching my unit on prehistory. Toward the end of that unit, students write journal entries and draw Snapchat illustrations that detail the lives of early hominids during prehistoric times.